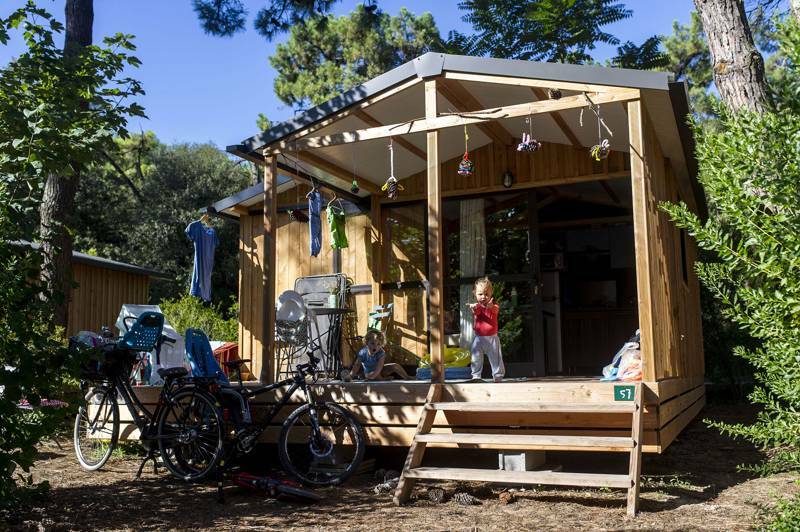 Nestled between Sainte-Marie-de-Ré and Flotte-en-Ré, the Huttopia Chardons Bleus – Ile de Ré campsite is located in the heart of a magnificent pine forest, 10 minutes by bike from the ocean. Enjoy an invigorating stay between ocean, vineyards and forests and set out to discover this little haven of paradise on the Atlantic ocean. Put on your sailor’s top and breath in the sea air: you are on holiday! 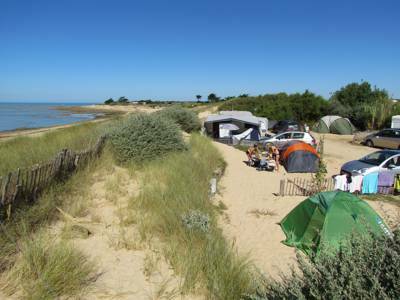 At Sainte-Marie-de-Ré, Notre Dame beach is recommended for shellfish gathering, the beaches of Montamer and La Salee allow you to swim when the tide is in, and Grenettes beach is recommended for surfing. Fancy swimming in fresh water? Children and adults will all love the new swimming pool and paddling pool at the campsite, designed in harmony with the natural spirit of the site. There is also a great new playground for your children to enjoy along with installation of brand new washrooms and a more pleasant reception area where you can ask for good tourism advice. 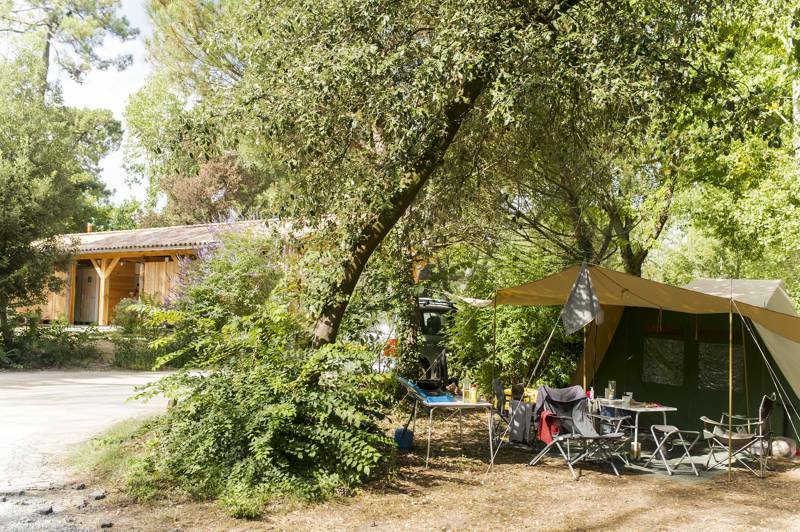 With markets, horse riding, cycling, hiking, and of course the Atlantic Ocean and beaches all on the doorstep of Huttopia Chardons Bleus, everything is accessible for a great stay on Île de Ré. 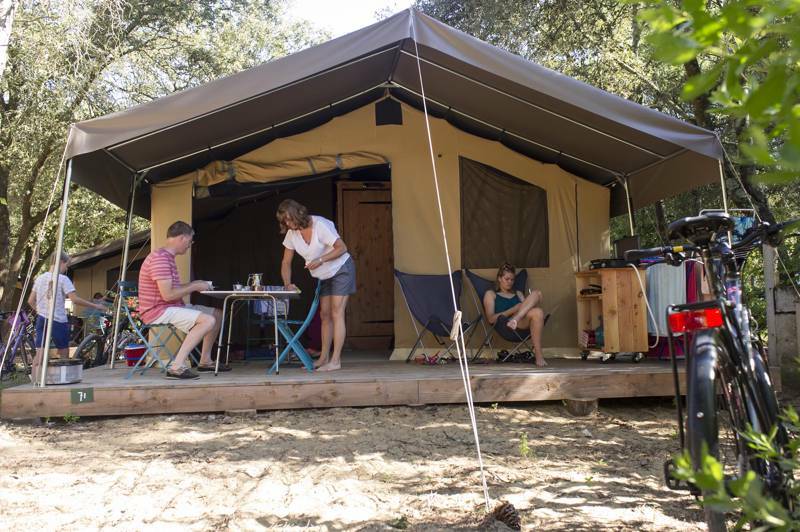 On a pitch in the shade of the pine trees, in a wood and canvas safari tent, a wood trailer or a chalet, everyone can camp the way they like best for a truly personalized holiday in France. 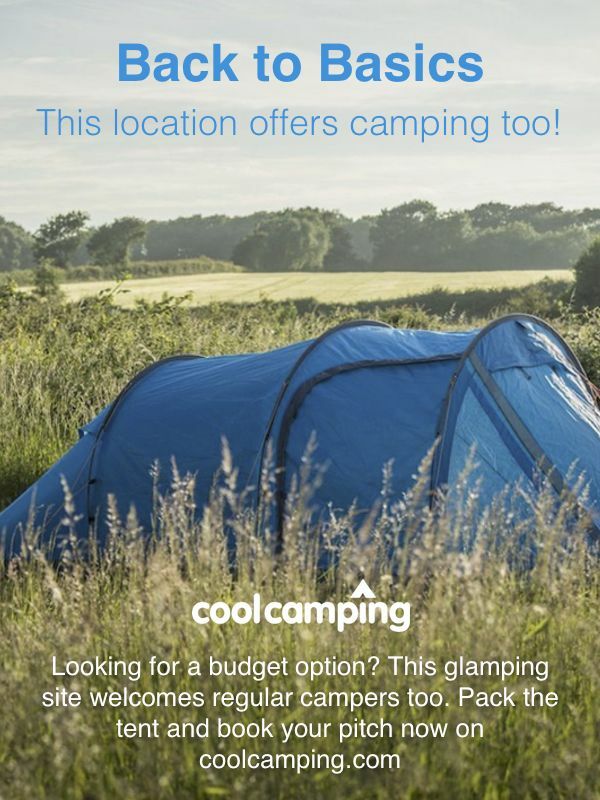 For latest availability and best prices for Huttopia Chardons Bleus, please use the Date Search above. There's a heated swimming pool and paddling pool and surrounding wooden decking with a snack bar and pizza restaurant during peak season. A central lodge with internet, free Wi-Fi, a TV room, library and board games; a playground, boules pitch and table tennis tables. Bikes available for hire. 'Camper's corner' shop for any essentials you've forgotten and tourist information in reception. Activities for children throughout school holidays. Camping on an island? Then it's the beaches you'll be visiting. Montamer and La Salee are the best for swimming when the tide's in and Grenettes is the one for surfers (you can hire boards right by the waterfront). At Sainte-Marie-de-Ré, Notre Dame beach is good for shellfish gathering. Windsurfing, kayaking and catamaran sailing are all popular here too, while, on land, bikes are the best way to get around with a good network of family-friendly cycle trails across the island (bikes are available to hire from the campsite). There are also public tennis courts 1km from Huttopia Chardons Bleus. For something less active, discover the Vauban fortifications – a recognised UNESCO world heritage site – visit the ramparts of Saint-Martin-de-Ré, the ruins of Abbey Châteliers, the Fort de la Prée and the steeple of Ars-en-Ré. A visit to Phare de la Baleine, the main lighthouse that is synonymous with Île de Ré, is also a must. The restaurant on-site serves excellent homemade pizzas, along with a host of other snacks and drinks best enjoyed out on the terrace. It's only open over the May public holidays and through July and August. There's also fresh bread delivery each morning (make sure you order the evening before). A whole range of delicious produce can be found among the island’s market stalls, with markets held every morning at la Flotte, Rivedoux and Sainte-Marie throughout the year. Oysters, sea salt, Pineau, Cognac and the island's delicious potatoes are the most local goods of choice. From La Rochelle, follow signs for Île de Ré. When you reach the island, take the South road (Sud) signposted at the roundabout just outside Rivedoux, then take the D201 and, after 4km, the D103 towards Clemorinant. The campsite is on your left (clearly signposted) after 650m. Around 200 pitches across 12 acres of pine forest, plus pre-pitched safari tents, gypsy roulottes and wooden chalets.